Shane Black and the cast of The Predator appeared at San Diego Comic-Con's Hall H to discuss the movie and unveil some brand-new footage that shocked those in attendance. There has been a ton of discussion about Black's take on the Predator franchise, which went through some reshoots that completely changed the ending, while reshaping the entire tone of the film. Since then, hopes have been high, and all of the recently released promotional footage has been hinting at some pretty awesome surprises. 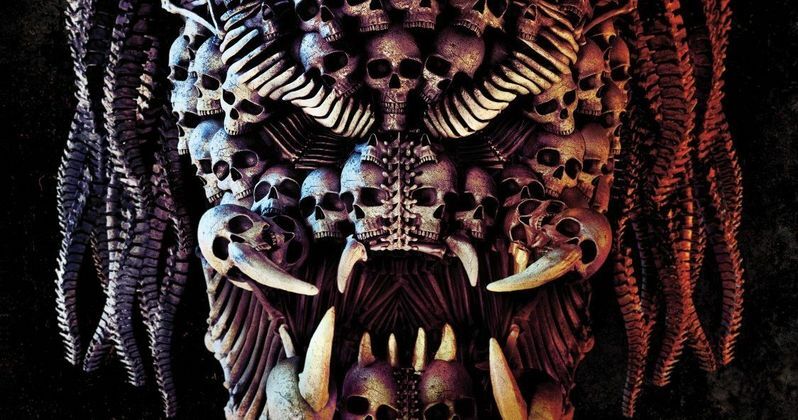 Upon arriving at Comic-Con, 20th Century Fox released a new chilling poster for The Predator, which shows the iconic face of one of the Predators made almost entirely out of human skulls. It's a truly disturbing image, which fits the footage description that was shown at Hall H earlier today. Director Shane Black and members of the cast treated the convention to some brutal scenes that focused on the gore and violence that the franchise is famous for along with some humor thrown in for good measure. In addition to director Shane Black, Sterling K. Brown, Olivia Munn, Keegan-Michael Key, Jake Busey, and Trevante Rhodes all appeared to talk about The Predator. The footage started with a sizzle reel, which featured the cast having a humorous argument about who Predators can and cannot beat in battle. Black then went on to talk about how the Predators are back on Earth. Black says that the Predators are angry because two of their champion hunters showed up and were killed, which leads to the extraterrestrial race accidentally being summoned by a young boy from his house. The first clip from The Predator that was shown at Comic-Con showed the cast waking Olivia Munn's character up after something went down with one of the Predators. It doesn't really give away much, but it does showcase the ensemble cast's chemistry and how well they work off each other. Shane Black complimented the cast, noting that they all went out of their way to practice their dialogue in order to nail their parts. That's all well and good, but everybody wanted to see what these new Predators are capable of. Shane Black did not hold back with the second clip from The Predator that he shared with everybody in Hall H. The scene was an extended piece from what we had seen in the Red Band trailer, which featured the massive Upgrade Predator for the first time. In the extended scene, a normal Predator is battling with the genetically modified version, only to see the poor regular Predator get his head ripped off with the spine still attached. This is the version of The Predator that everybody wanted to see. The scene was its own thing, but it's clearly an homage to the 1987 original film. All in all, it looks like Black's shot at the franchise is going to be dark and violent. You can see the new skull poster below, thanks to 20th Century Fox.